Het is ons een eer om niemand minder dan Catherine Hall aan te mogen kondigen als keynote spreker tijdens de historicidagen 2019. Catherine Hall is emiritus hoogleraar geschiedenis en directeur van het Centre for the Study of British Slave-ownership aan de University College London. Samen met Leonore Davidoff schreef ze het boek Family Fortunes. Men and Women of the English middle class, 1780-1850 (1987/2002). In haar recente onderzoek en publicaties focust Hall zich op de relatie tussen Groot Brittannië en het voormalige ‘British Empire’. Deze thematiek komt onder andere naar voren in: Civilising Subjects (2002), Macaulay and Son (2012) and Hall et al, Legacies of British Slave-ownership (2014). Tot slot was Hall tussen 2009 en 2015 Principal Investigator van het ESRC/AHRC project, genaamd ‘Legacies of British Slave-ownership’. Het doel van dit project is slavernij een plek te geven in de Britse geschiedenis. We are honored to welcome Catherine Hall as the key note speaker to the Historicidagen in Groningen, The Netherlands. 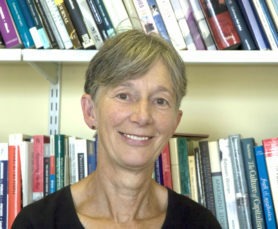 Catherine Hall is Emerita Professor of History and Chair of the Centre for the Study of British Slave-ownership at University College London. Family Fortunes. Men and Women of the English middle class, 1780-1850 (1987/2002) was co-authored with Leonore Davidoff. Her recent work has focused on the relation between Britain and its empire: Civilising Subjects (2002), Macaulay and Son (2012) and Hall et al, Legacies of British Slave-ownership (2014). Between 2009-2015 she was the Principal Investigator on the ESRC/AHRC project ‘Legacies of British Slave-ownership’ – which seeks to put slavery back into British history.